THE International Olympic Committee, at its meeting in Barcelona, April 25 to 27, 1931, approved the final programme of each sport in the Games of the Xth Olympiad, as submitted by the International Federations. After this approval no changes could be made, and the Organizing Committee was free to broadcast the programme to the world and definitely lay the foundation of the organization that was to manage the various events. The schedule, covering a sixteen-day period, consisted of competitions in sixteen sports and demonstrations, and comprised a total of approximately one hundred and thirty-five individual programmes, to be held in nine different stadiums, auditoriums and water-courses. It was the task of the Executive Staff to present this complex schedule to the public simply and intelligibly, and at the same time in sufficient detail to enable purchasers to make an intelligent selection of the events they desired to attend. The world is informed and interested in sports generally, but few people have a true conception of the comprehensive field of sport embraced in the Olympic Games programme. In order to give a complete picture of all the competitions at a glance, the schedule was reduced to chart form, showing graphically the events of all the sports, those which would take place in the morning, in the afternoon, and in the evening of each day, and the stadium in which each event would be held. This chart was used as the key in preparing all Olympic tickets of admission. (1) The Single Event Reserved Ticket: To be sold in advance. To be sold in advance for events where reserved seat tickets were not printed, and also to be sold on the grounds at all stadiums on the day of the event, in case the event had not been sold out in advance. 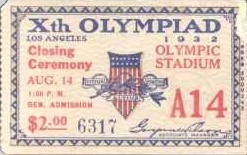 This ticket greatly facilitated the sale at the stadiums on the day of the event. It was more economical for the management and simplified the handling of the crowds. In selling reserved seat tickets on the grounds as the crowd is assembling there is necessarily discussion with the ticket salesman regarding the location of the seats, etc., which consumes time. In selling a general admission ticket, however, the purchaser takes the ticket without question and immediately proceeds into the stadium through any of the general admission entrances, making his own choice of the best available seat. Thus, also, he is more quickly seated. 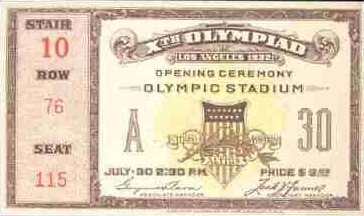 (a) The Olympic Stadium Pass: A transferable ticket which would admit the holder to the same reserved seat at all the events held in Olympic Stadium during the sixteen-day period of the Games, including the Opening and Closing Ceremonies, all of the Track and Field Athletics, the Demonstrations of American Football and Lacrosse, the Gymnastics, Field Hockey, and the two final days of the Equestrian events. 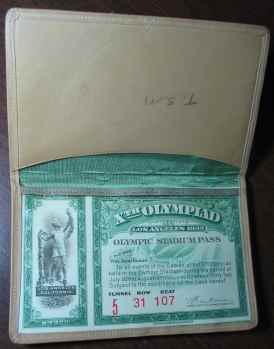 In addition, this pass included the Olympic Victory Ceremonies held in Olympic Stadium each day for the winners of all Olympic competitions, whether the competitions were held in Olympic Stadium or elsewhere. This was a very comprehensive programme and the Olympic Stadium Pass proved to be the most popular ticket. 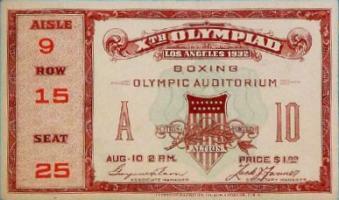 It was realized in the beginning that several of the sports which were to be held in Olympic Stadium were not generally known in this country, and that by creating a ticket including these sports, those holding the tickets would attend them, thus making these sports better known and more popular. This is in exact accordance with the Olympic ideal of furthering interest in all sports throughout the world. These tickets were featured throughout the period of the ticket sales. They were nearly twice the size of the individual event tickets, and each ticket was put in an individual leather case. They were printed in green and blue, for opposite sides of the Stadium, and the color of the container was carefully selected to harmonize with the color of each ticket. The special design on the plate was cut by the best obtainable steel engraver, who spent some three months completing his work. ( b ) Season Tickets for Individual Sports : These were issued for certain sports where the programme was extensive enough to warrant such a ticket, and entitled the holder to a reserved seat for each programme of the sport for which the ticket was issued. These sports included Boxing, Wrestling, Rowing, Swimming, and Fencing. In selecting a design for the tickets of admission, three principal features were given consideration. ( 1 ) The tickets must clearly indicate the name of the sport, the date, the time of day, the location, the seating assignment, and the price. It was essential that tickets for each individual event should be easily identified, for with thousands of people purchasing tickets weeks or months in advance for many different events, they might, if error occurred, present the wrong tickets at the gates, which would cause inconvenience and embarrassment. In order to guard against this possibility, there was printed on each ticket, in large type, the number representing the date of the event and one of the letters M, A, or E, as a code identification indicating for what date and time of day that ticket was valid. 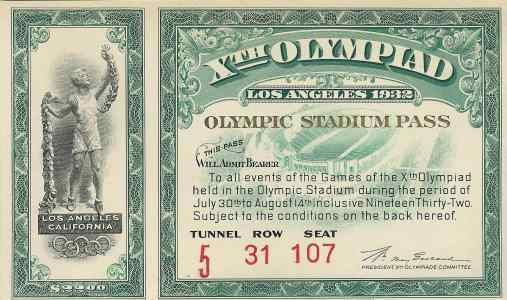 The tickets were further separated and distinguished by sports or stadiums, by selecting a distinctive color and printing all tickets for that sport or that stadium in that same color throughout. 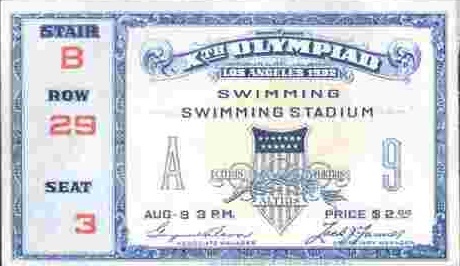 For example, all tickets for Swimming were printed in blue, all tickets for events at the Olympic Auditorium were in red, all tickets for Track and Field Athletics were in orange, and the tickets for all other events at Olympic Stadium were in brown. 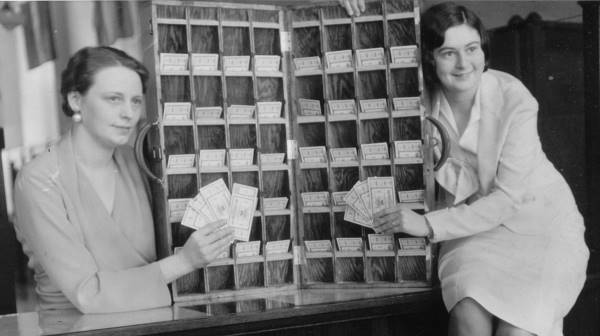 While this method of identifying tickets was of great value in insuring the presentation of the right tickets at the gates, it was of even greater value in facilitating the stocking and counting of tickets in the Ticket Department, which handled an aggregate of 2,941,057 tickets provided for the Games. ( 2 ) The tickets must not easily be counterfeited or duplicated. They had to be distributed many months in advance of the Games, and to all parts of the world, and every precaution must be taken to prevent any possible duplication or counterfeiting. A special ìsafetyî paper stock was ordered from one of the most reliable paper companies in the United States. This paper was made in three layers, the middle layer being blue and the two outside layers white. The middle layer was specially watermarked and this watermark could be detected only by looking through the ticket against sunlight or other strong light. All tickets except general admission tickets were printed from hand engraved steel plates. Each design had certain secret marks known only to a few members of the Executive Staff. A lithographed spot was printed over the face of each ticket in a different color from that of the engraved design. Great care was taken in the combination of colors used, to make it as difficult as possible to photograph the tickets successfully should duplication or counterfeiting be attempted. There were, besides, several other important protective features. (3) The element of beauty was not overlooked in the ticket design. Although utility and safety were the prime considerations in the manufacture of the tickets, every effort was made to have them artistically worthy. 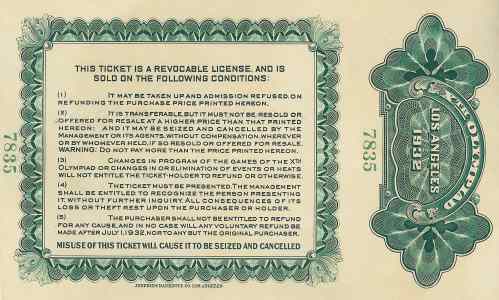 It was realized that many would retain their tickets as souvenirs, and that after the Games there would be requests for samples for souvenir purposes, and for permanent exhibits in museums, libraries, and other institutions.